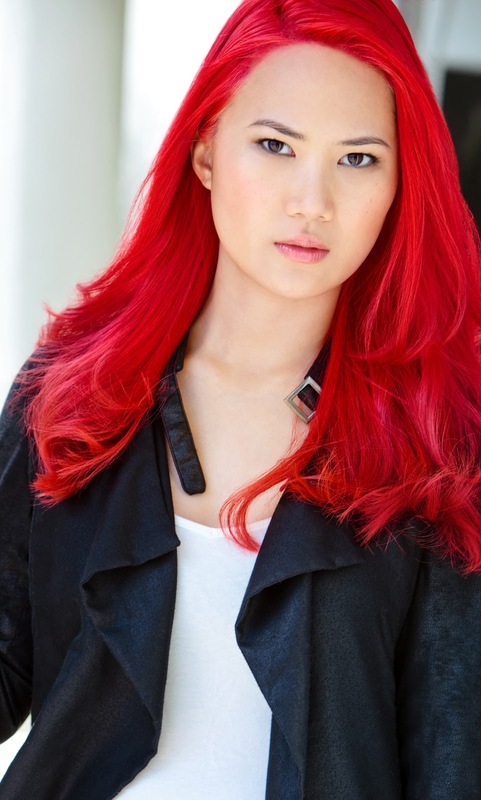 Elena Choo, beautiful and making her mark all across the globe with her acting talent and red hot hair. Daily Style Entertainment sits down with Elena to talk about career and rise to celebrity. I’ve seen you credited with different names on different shows, why do you keep changing your name? There are two reasons, really. I always used a stage name because I thought that if I ever want to change my career into a corporate one, then when people Google up my real name, they wouldn’t find my acting career. Looking back, I see a lot of holes in that plan, with the Internet and all. Also, I was pretty shy when I first started out, and wanted to keep my acting career out of the spotlight from people back home in Indonesia, so I took up an alter ego by picking out letters from my name, Evelyn MagdaLENA into Elena. And Choo is just how ‘Tjoe’ is pronounced. I’m permanently Elena Choo. Okay Elena, name one project that has left the biggest impression on you so far, and why. If I would have to choose only one, it would have to be my first film, “Epiphany”. I was kind of scared, you know, everybody had been doing it for a while and I was green as grass. But the director and crew were so helpful and kind, teaching me stuff on set. When I heard it won awards in so many festivals, I felt like I just hit a home run on my first hit. I am ever grateful to be part of it, not to mention it was my first film ever! So you started your acting career in Singapore, then left for Hollywood to further your career, do you ever think about going back? At first I left Singapore to shoot a television pilot “Backlit”, but I decided to be based in Los Angeles to further learn acting and work has just kept me busy here all this time. But I have definitely kept in touch with Singaporean filmmakers and I am very much open to work in Singapore again. In fact, I am going to try work in Indonesia as well. It’s my hometown, but I’ve never tried working in the film and TV industry there. Hopefully if I get a production there, I’ll get to see more of my family. What projects do you have up your sleeve right now? Last year I got to work opposite Keanu Reeves in a movie called “Bad Batch”. It’s in competition for the Golden Lion in the 73rd Venice International Film Festival this year. I also made an appearance on a new Netflix series “LOVE”. There’s also action movie that I produced, “Syndicate Smasher”, that’s going to be screen for public as soon as November. I’m also very excited to let you know that I’ll be starring in a new epic trilogy helmed by Eric Chang, an Indonesian-born director from New York. Can you tell us more about “Dante”? “Dante” the film will be a trilogy, adapted from poetry to film from arguably the greatest Italian poet Dante Alighieri’s Divine Comedy. Divine Comedy the literature describes Dante’s travels through Hell, Purgatory and Paradise. So in the first movie installment, “Dante’s Inferno”, I will be playing a Florentine woman named Beatrice Portinari, a woman who Dante meets on his journey who becomes his lifelong love and muse. When the director Eric Chang first told me his vision he has “Dante”, I was a little worried because this is whole ‘epic’ genre is completely new territory for me. I’m psyched to be working with him, and he’s going to have to get comfortable working for me for many years to come on this (laughs). What do you have to say to foreign actors who want to pursue a career in Hollywood? When I was a little girl in Indonesia I used to be embarrassed to have such high dreams, to want to be an actress in Hollywood. And I thought it would be impossible for me. But one step at a time, I got here. And I’m still here. If I can do it, anyone can too. Just keep practicing those accents. Elena Choo and co-actor interviewed by Hollywood Elevator Magazine at Asians on Film 2014.